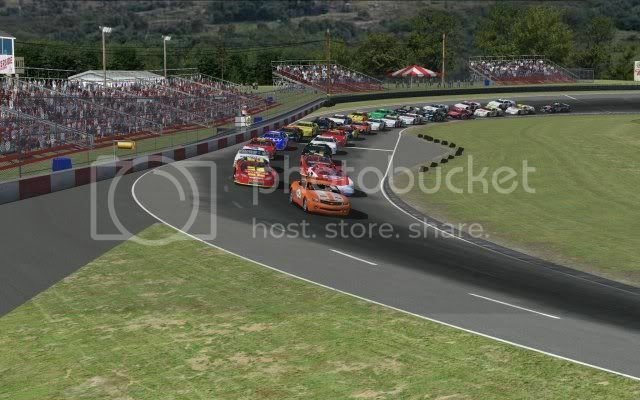 We are very happy to make Riverside Speedway NH available for the NR2003 sim racing community. This 1/4 mile high banked (16 degrees) asphalt oval is modeled after the real track located in Groveton, NH. Riverside Speedway features weekly Saturday night racing with Late Models, Outlaw Sportsman, Super Stocks and other classes along with regular visits by the very popular ACT cars for special extra distance events during the season. This version of Riverside Speedway NH is truly a team effort by Aaron Maynard, Matt Gilson and J.R. Franklin. It is based off of the "riverside_speedway_alpha3" track created by Windy City Racing, but our friends over at WCR are hardly going to recognize their track now. We hope that they will find that we have done their alpha effort proud after this complete makeover. The track features racy A.I. for 30 cars, multiple racing grooves and grips and is compatible for both online and offline racing. Many people contributed to this project in their various specialties. Please take the time to read through the CREDITS_README text that comes with this track for a complete summary and important information about the track. So get ready to beat 'n' bang in some fun and exciting side-by-side short track action.